John David Ashcroft (born May 9, 1942) is an American consultant, lobbyist and politician. He was the 79th United States Attorney General. 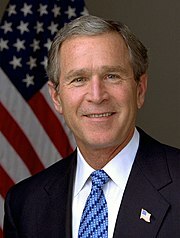 He served during the first term of President George W. Bush from 2001 until 2005. Ashcroft was previously the Governor of Missouri (1985–1993) and a U.S. Senator from Missouri (1995–2001). Ashcroft was born in Chicago, Illinois. 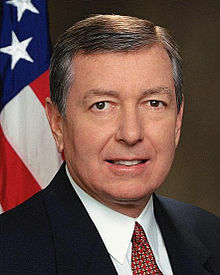 ↑ 1.0 1.1 "John Ashcroft Biography". Biography.com. Retrieved 15 January 2013. This page was last changed on 24 November 2017, at 18:19.